At the beginning of September we responded to the petition of communities in Nilo, Cundinamarca to stand witness to the continued destruction of their habitat, now on behalf of extractive activities, as dredgers from a sand extraction company devastate the local Sumapaz River. Communities first settled in this area around 1920 and in 1954 the military training base of Tolemaida was installed in close proximity and all land was given to the military. Today Tolemaida is one of the biggest military training bases in Colombia and attempts to displace these communities despite several state protections in favor of the communities. Check out our facebook photo album to learn in detail about the different threats the community of Nilo faces. With our partner Tierra Digna, a Colombian collective of lawyers, we accompanied the event “For life, dignity and integrity: Guarantees for communities in mining zones” in the department of Cesar, one of the most active open pit coal mining areas in Colombia. 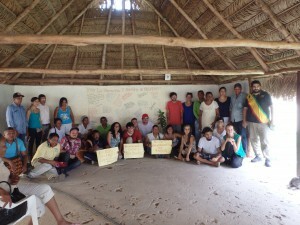 Communities and human and environmental rights defenders came together to exchange their experiences and learn about new strategies to confront extractive industries’ affects on more communities throughout Colombia. If you want to learn more about the work of Tierra Digna and the struggle of communities affected by large-scale extractivism and you happen to live in the US, we will hopefully see you during the upcoming FOR Peace Presence Tour with Tierra Digna! (see below). 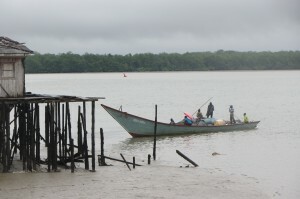 While accompanying in the Humanitarian Space of Buenaventura, news from t he Inter-American Commission on Human Rights arrived and brought hope. Protective Measures, called “preventive measures” or ‘medidas cautelares’ have at long last been approved – these measures will cover more than 1000 people, who stand for an alternative to violence in the midst of one of the most violent cities in all of Colombia. Now concrete protections, such as a school bus for the children and an armored car for the leaders of the space, have to be implemented by the Colombian state. We hope to contribute to a fast implementation by insistently reminding out different national and international agencies of their obligations. On Colombian Human Rights day, we accompanied a Human Chain protest, formed by 1200 farmers who are victims of the armed conflict in the area of Montes de Maria in the department of Sucre and Bolivar. These farmers not only demand the liberation of their imprisoned leader Jorge Montes, but also demand that the government fulfill agreements reached after a Peace March in April of 2013. In March 2014, FOR Peace Presence had visited the zone of Montes de Maria with our 2014 FOR Peace Presence International Delegation. Speaking of delegations – In September we announced our upcoming Spring 2015 FOR PP Delegation to Colombia. The program will focus on our core partners and the struggle over land throughout Colombia. 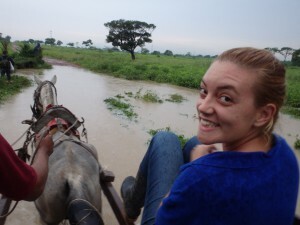 If you’d like to take part in an on-the-ground educational experience in Colombia, join us: What’s Land Got To Do With It? Prospects and to Lasting Peace in Colombia. We are very excited to share with you that after some busy weeks of preparation, one of the two joint-FOR Peace Presence Speaking Tours began in September. Mario Cardozo received the Mohammad Ali Humanitarian Award in Louisville, Kentucky and is now on the East Coast, where he will be until the end of October. Mario was declared Colombia’s first conscientious objector for non-religious reasons, and he is there sharing his music and experience. And as for our second speaking tour – we had some very exciting moments in the month of September. The Inter-American Commission on Human Rights confirmed a hearing on forced displacement due to mega-projects in Colombia with Johana Rocha of Tierra Digna, and 8 other Colombian organizations. FOR Peace Presence accompanier Kaya and human rights defender Johana Rocha of our partner organization Tierra Digna will be on a US speaking tour from October 24 – November 16. They will be traveling through Washington DC, New York, and the Bay Area, California, sharing with audiences the links between multinational extractivism and human rights abuses in Colombia, and how communities have sculpted alternatives in the face of displacement by large-scale development projects. Please contact us at info@peacepresence.org to hear Johana speak in your city! We cannot do this work alone – it requires various forms of support. Sometimes we put up calls to action on our Facebook or website, and sometimes we ask you to write to your local members of congress. If you can take a moment today to donate to FOR Peace Presence, it will help ensure that we can continue our physical, protective accompaniment along-side partners in the field, as well as our political advocacy and movement building work. Your help remains invaluable to this cause.